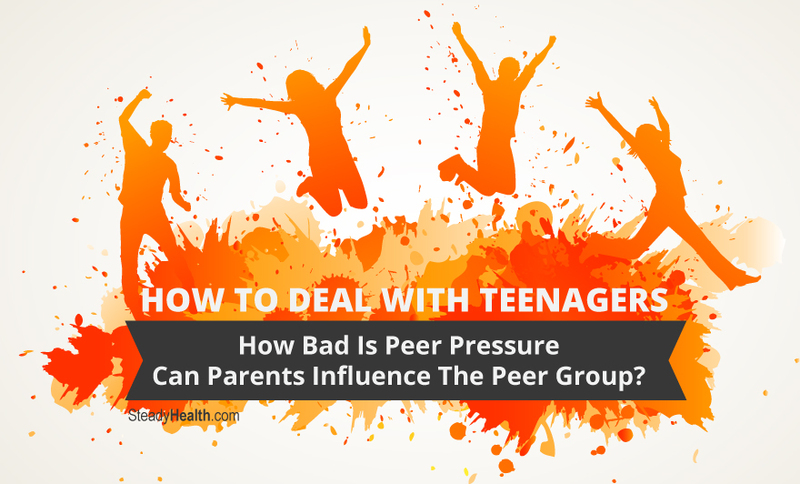 How To Deal With Teenagers: How Bad Is Peer Pressure, And Can Parents Influence The Peer Group? Teens' peer groups are pretty much all-powerful, and there's nothing you can do about it — or is there? And is peer influence all bad for teenagers? Then we moved, and I had to go to a new school. Though I'd gotten on pretty well until then thanks to that weird group of friends, it hadn't all been plain sailing, and I decided to make a change. I pretended to be interested in music I wasn't, and dressed in clothes that looked like those "everyone else was wearing". A while into this new adventure, my mom lamented my apparent need to become someone else for the peer group. Me? I was simply relieved that I got in with the popular crowd, didn't get teased at school anymore, and actually made some really nice friends. It was an easier path, let's not deny that. My also counter-cultural mom might have considered them a bad influence, but they didn't drink or do drugs, and prioritized academic performance, so it could certainly have been a whole lot worse. If you're the parent of a teenager or soon-to-be teenager, some version of this story will probably sound familiar to you — as it now does to me, from the other side of the fence. Are you wondering how to deal with teenagers' apparent mindless readiness to abdicate their own selves to the collective self of the in-crowd, shocked as you see "your baby" being sucked ever more deeply into the vortex of the peer group? You are most certainly not the only one. It's not all bad, though. In the social realm, peer groups (nicer terminology than "cliques", isn't it?) allow teenagers to develop conflict resolution skills and negotiation skills , as well as, I'd assume, the code switching skills we all need in adulthood as we effortlessly transition from one environment (such as work) to another (a night on the town with friends, for instance). I Don't Think I Like My Teen's Peer Group — What Do I Do? You bet you that the peer group has a lot of influence, including, for instance, on whether your teen will become a substance abuser . The study from above , however, interestingly found that the suggested parental behaviors have an indirect impact on your child's life choices. Your positive involvement can and does lead a teenager to become more self-reliant, to perform better academically, and to be less likely to use drugs. Thee choices can then have the knock-on effect of leading your teen to choose more positive peer groups. If the peer group itself encourages positive (academic and athletic achievement, for example) or fairly harmless (clothing choices) behaviors, you probably don't have any reason for concern. Rather than wondering how to deal with your teenager and the bad influences surrounding them, you can be happy in the knowledge that your teen's friends are helping him or her hone social skills to last a life time. If, on the other hand, things aren't that rosy, you can decide whether to try communication tactic for a low-conflict relationship with your teen and see if you can reach a mutually agreeable solution, or whether to take harsher steps. These might be warranted if your teen's school performance is taking a serious hit, and definitely if there's evidence of substance abuse, eating disorders, or unsafe sexual activity.